-I’m a little late in reporting this cause I’ve been busy (like when haven’t I been right? ), but better late than never…. 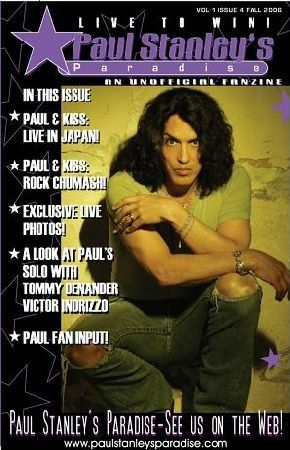 In Issue #4 of Paul Stanley’s Paradise-an Unofficial Magazine-there’s a section called “One Last KISS…” which contains quotes from KISS/Paul Stanley Fans. It just so happens that in Issue #4 one of my quotes was on there! It went like this…. This entry was posted in INTERVIEWS, KISS, MUSIC and tagged Fanzine, Issue #4, KISS, Paul Stanley, Paul Stanley's Paradise, Quotes, wayne w johnson, WWJ. Bookmark the permalink.